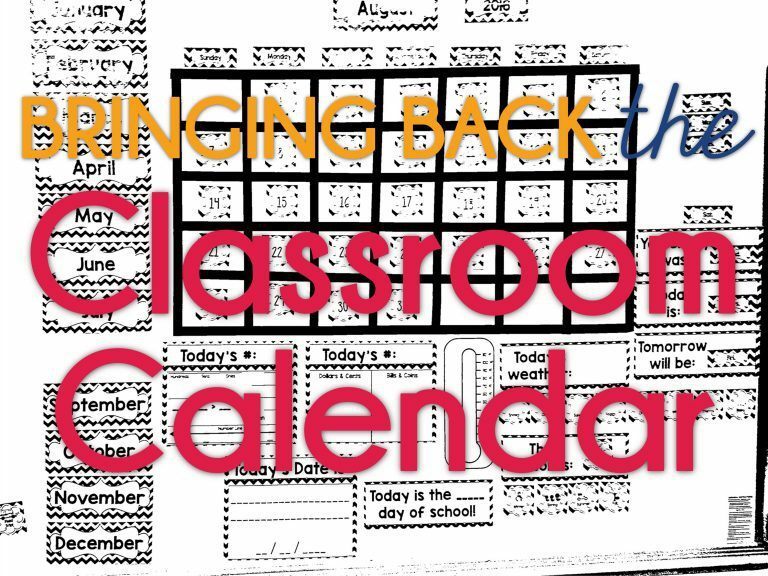 Classroom calendars used to be commonplace in nearly every first grade classroom, and even a lot of second grade classrooms. As the push for standards accountability has grown, I’ve noticed fewer and fewer teachers implementing calendar in their classrooms because the “standards” don’t “dictate” it, or because they just are feeling the time crunch and with the struggle to fit everything in, calendar has been cut. I’m going to share with you why I think calendar is so important in the primary grades to help convince you if you’re on the fence, but also to give you some support if you need to justify the use of the time to someone questioning your practices. Calendar is hands down my favorite time in my first grade classroom, and my students love it too! Successful calendar routines are so much more than just singing the days of the week and the months of the year. While this is an important part of my calendar time (I don’t care what the standards say as much as I would much rather have adults that know how to say and spell days and months and know how many days each month has. It takes just a couple minutes. I digress) there are so many more math standards that can be included as part of your daily calendar routine. These help give students a tiny bit of practice every.single.day and helps build their number sense as they apply their number into different formats and math applications. Clearly, part of the calendar routine is the actual calendar. This is when you can talk about the days of the week, the months of the year, the number of days, concepts like yesterday, today, and tomorrow, etc. I start the year walking through this slowly with my students in a group and then slowly give them more ownership as the year goes on by having my Student of the Day complete portions as their morning work, and then just briefly running through it together during calendar. It’s truly a gradual release with students doing all of the calendar by the end of the year and our time together is dedicated to our Number of the Day. I have the months lined up on one side of the calendar, and then my today, tomorrow, and yesterday system on the other. I use abbreviated days of the week for that because it helps students see the abbreviations in action and understand what they are, so when we get to the standard about abbreviation for grammar, they have a context to connect to already. (See, here’s a standard). We use the months to help us sing the month song from time to time, and with the days along the top we can use that to sing the days of the week as well. We write the date each day on the date sign practicing different forms of the date and bringing in those abbreviations. We also track the seasons throughout the year. I use both autumn and fall interchangeably so students get familiar with the different terms. We also track the weather each day. Because I created my calendar set, I made cards for basically every type of weather we have here in Chicago (though it often changes more than once a day) and they should cover what most other people experience (science standards). We also use a thermometer to track our temperature each morning (math and science standards). And now comes to the real “meat” of the calendar routine; the why it’s so important; the component that built my students’ number sense like I’ve never seen and solidified so many first and second grade standards. We use the Number of the Day (the number of days we’ve been in school) to practice and review various number sense skills and math standards. We begin with the first day of school, but we gradually add and build the skills within the first two weeks. We write the number in ordinal form (1st, 2nd, etc) to help us track where we are in the year. We also read the sentence aloud so students are hearing the proper way to say those numbers. We also review various number sense skills. We don’t begin this one until after the third day of school so we don’t have to work with negative numbers, and we go with the hundreds chart frame beginning on the 10th day of school. Every day we review even and odd, number lines, greater than and less than, and place value. As the year goes on, this job is be given to a calendar student to complete independently during morning work time, and we quickly review a couple components during our time together. This one page covers and reviews so many math standards. With daily practice, it helps to solidify for students what each of these concepts are. We also use the number of the day to review money. We begin this on day one, and a change from some of the other routines is that we don’t erase this page each day. So when we come over on the second day, we see one penny and add one more for the second day. Then on the fifth day, we add that penny and discuss how 5 pennies are the same as 1 nickel and we’ll erase and exchange. By writing the amount in dollars and cents each day, we help to show the decimal system in a little way beginning right from the first day of first grade. It also helps build the concept of 10 as the tenths place gets used. Finally, and my favorite part, we use the Number of the Day to show multiple ways to make the number. During this time, students offer their ideas for ways to make the number. At the beginning of the year, students offer very low level, basic facts. As the year goes on, students begin experimenting with new things. I also do some on the fly teaching by introducing new skills here and there. For example, students might give 10+10 and I would use that to show them 5+5+5+5 or 10×2. This is an amazing time that is naturally differentiated as students who are ready to apply more difficult concepts offer them up. You can quickly explain them as you record them. Here are some images from our number building throughout the year in first grade. You can click the arrows to scroll through. Vickie from Primary Press does an amazing job with this in her kindergarten classroom. Yes, that’s kindergarteners using parentheses to multiply. It naturally fits that as the kids are ready for more, the numbers get larger. As skills become easier for students, less time needs to be spent on it whole class and you can use that time to quickly review choice concepts and then spend additional time with students building the Number of the Day. It’s a low stress way to continue to spiral back to key concepts throughout the year. I sometimes timed our Number of the Day to 7 minutes, but often would just let us keep working on days when students were producing so many great number combinations. You can see more about my Number of the Day routine in my Number Sense blog post by clicking the image below. My calendar system matches the black and white theme of my classroom. If you’re interested in either my decor set or calendar system just click the images below. Or, if you’re interested in both sets, I offer them as a bundle at a discount. If black and white is not your favorite or your theme, I offer a couple different styles and am working on others. You can see all of them by clicking here. Do you do a calendar routine in your classroom? Do you work on anything different during that time? I love your calendar. As a high school, teacher i still post a large monthly calendar on my board made from washi tape. I post our daily work or plans for the day. At the end of the month I snap a picture of it to post on Edmodo, a Sway to send to parents, and to keep for the next year’s planning.